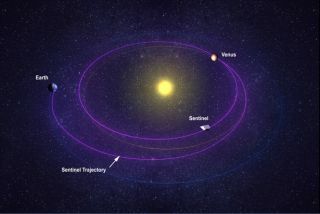 This illustration shows the Venus-like orbit of the Sentinel Space Telescope, a private deep-space observatory to seek out potentially dangerous asteroids. The telescope is planned by the B612 Foundation. This story was updated at 2:12 p.m. EDT. A private space telescope mission that aims to discover 500,000 near-Earth asteroids is technically sound and on track for a 2017 launch, a review panel says. The mission design and implementation plans for the Sentinel Space Telescope — which is being put together by the nonprofit B612 Foundation and its partner Ball Aerospace — are solid, according to the panel, which is called the Sentinel Special Review Team. "This is a major milestone in the development of Sentinel, and has validated the enormous amount of design and planning work that has already been carried out by Ball Aerospace," SSRT chair Tom Gavin, former director for solar system exploration at NASA's Jet Propulsion Laboratory in Pasadena, Calif., said in a statement. The review represents the first big milestone in the Sentinel project, said B612 Foundation chairman and CEO Ed Lu, a former NASA astronaut. The SSRT looked at "how we plan to go about building the telescope, how we plan to manage this project, what the basic requirements are for the mission and how they'll flow down into requirements on the spacecraft, and the initial technical briefings on the spacecraft by subsystem," Lu told reporters today (Oct. 11). The review team found the Sentinel mission to be feasible, with a high chance of success, Lu added. "Essentially, we're on the right track," he said. The B612 Foundation plans to launch Sentinel in 2017, placing the instrument near the orbit of Venus. Sentinel will look outward from there, scanning Earth's neighborhood without having to fight the sun's overwhelming glare — a serious impediment to asteroid-hunting instruments on or near our planet. The telescope's infrared eyes should spot about 500,000 near-Earth asteroids in less than six years of operation, B612 officials say. That would be quite a feat, considering that researchers have discovered just 10,000 or so such space rocks to date. Sentinel's observations will help researchers develop the first-ever detailed, dynamic map of the inner solar system, B612 officials have said. This map should allow scientists to identify potentially hazardous asteroids years or decades before they may strike Earth, giving humanity enough time to mount a deflection mission. The map will also spot space rocks that could make inviting targets for human exploration or mining activities down the road, officials have said. B612 officials have not given a firm cost estimate for Sentinel, which is being funded privately. But the mission's price tag will likely be around several hundred million dollars, Lu has said.